Get a Free AC Replacement Estimate Online! How Much is a New Air Conditioner? Your estimate will contain a great offer* on a standard 14 SEER model and a more energy efficient 16 SEER model Goodman air conditioner. Your quote will include installation, tax, permits, a full 10 year parts warranty and a one year warranty on labor — as well as all available rebates and discounts. Read FAQ. No bait and switch tactics – we promise! Honesty and integrity are fundamental to our business philosophy. We will install the equipment we quoted for the price we quoted assuming the information you provided is correct. FL Green Team is the expert in air conditioner replacement in Fort Myers, Naples, Cape Coral, Estero Bonita Springs and throughout Lee and Collier counties. Find out if you are in our service area. If you air conditioner is not working at the moment, consider calling for 24/7 emergency ac repair service at 239.432.1500. Of course, you can continue to use our estimate calculator. If you have multiple Air Conditioners that you are interested in replacing you must fill out this form for each one. The best way to find out the size of your air conditioner or heat pump is by first locating its model number. The model number is located on a metal tag on the outdoor cooling unit (condenser), OR if you have another proposal from that model number. Once you find the model number, read it and look for a number that is divisible by 12. We can use this number to calculate the size of your system. For instance if the model number is TTB736A100A1, you will notice that there is a 36 embedded in the model number. You can divide that number by 12 and the result is 3. This means your air conditioner / heat pump is 3 tons. Please update the Equipment Size in the dropdown menu above. If you were not able to determine the tonnage, please proceed below. Please fill out the additional fields below. One of our HVAC sizing specialists will determine the proper size for your unit and provide you with an estimate shortly. Instructions: Click on the button above. Put in your address and postal code. Click on Parcel Details and look for Total Living Area. Instructions: Click on the button above. On the left side look for Search Database. Click on "I accept" terms. Type in your address. Click on Sketches. Look for Base Living area and give us the Area. Instructions: Click on the button above. Put you address in the appropriate spot. Click on Parcel ID. Look for AC / Area. Your estimate will be emailed to this address. Fill out this short, two-page form to give us details about your current air conditioner and your contact information. When you’re finished, click the “Get My Free Estimate!” button at the bottom of page 2. In a few minutes, check your e-mail. Your custom price estimate will arrive in your inbox. If you’re ready to move forward with purchasing your new air conditioner, simply reply to your estimate email or give us a call at 239.432.1500. We will schedule one of our expert technicians to verify the installation information, provide a detailed written price and quote any additional options you may be interested in. No, your custom estimate is absolutely free. Although we hope you consider using our services, you are not obligated to purchase any product or service from FL Green Team. What if I don’t know my equipment size? An air conditioner’s size is measured in tons. This refers to its cooling capacity, not its physical weight. If you don’t know your AC’s tonnage, click on the Equipment Size dropdown menu and select “I don’t know”. Instructions on how to find your AC’s tonnage will appear. Do you guarantee that the price I see in my estimate is the exact price I will pay for my new air conditioner? Honesty and integrity is fundamental to our business philosophy. We will install the equipment we quoted for what we quoted assuming the information you provided is correct (see below). We can offer options and promise you we won’t try to sell you something you don’t want or need, nor will we resort to high pressure sales tactics. With that said, if additional work outside the scope of a standard installation is required, there will be additional charges. We offer a number of different brands and models depending on multiple factors. Please feel free to contact us for additional details and for a full list of options. What if I want to upgrade to a higher efficiency air conditioner? The estimate will show you a price for a 14 SEER (Seasonal Energy Efficiency Ratio) air conditioner and a 16 SEER Goodman air conditioner. If you’d like to upgrade to a higher efficiency air conditioner, heat pump or add additional features like a filtration system or a smart thermostat, please call us directly at 239.432.1500. We will provide you with an adjusted estimate. *Disclaimer: Your estimate’s accuracy will vary depending on the accuracy of the information you provide to us in the form details and any additional items or other variables that may increase the cost of installation. The estimate does not include the price to make changes to your home’s electrical system, ductwork or refrigerant lines that may be required. 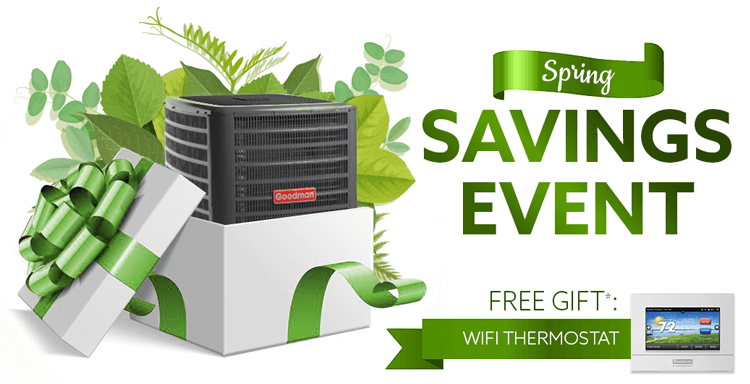 **Get a free WiFi Thermostat with the purchase of a new Goodman air conditioner. Cannot be exchanged for any other item or for cash. Cannot be combined with any other offers. Actual products not shown – for illustration purposes only. Offer ends June 21, 2019.